The clever way to inspire holiday makers and build your CRM. 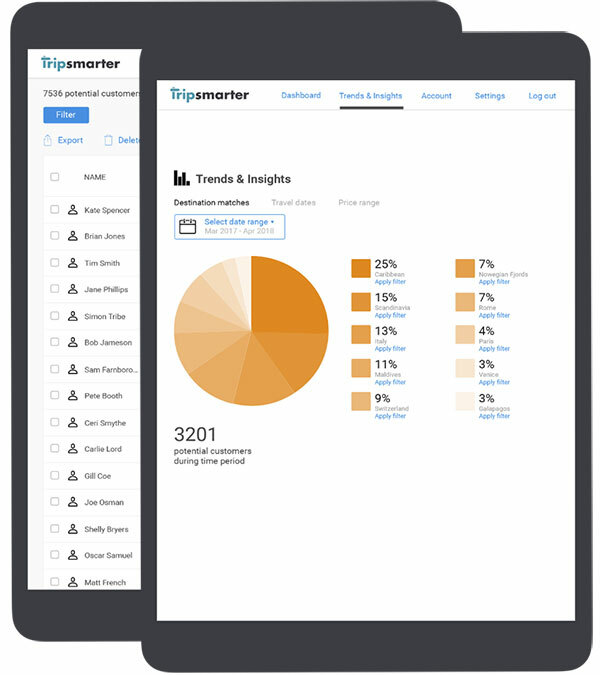 Tripsmarter is a fun and engaging way to inspire your customers. It uses machine learning to understand your customers holiday preferences and match their perfect holiday. In return, you get extremely rich data about your audience, you're able to engage with them about what they're excited about and convert potential customers into direct sales. The Tripsmarter visual questionnaire can be customised to suit your business needs and brand. It allows potential customers to use a swiping interface making it fun for them to choose their holiday preferences. As Tripsmarter builds up a picture of the customers world, the holiday suggestions become more relevant and useful. This is where the real fun begins — Tripsmarter will generate rich, actionable data which can be used to inform your marketing activity. It helps you to analyse trends for popular locations, dates or price brackets. Or create a campaign — targeting the customers who you know are interested in a location, during a specific time period. Your customers get lots of emails every day - to avoid your email being deleted the only way to engage is to offer them content that is relevant and timely. By analysing the data you will be able to predict if they are still researching their choices or ready to book. A timely email advertising a deal could make you a booking rather than a competitor. Want to know how Tripsmarter can work for you? Get in touch and we'll answer all your questions.